This revolutionary new draining cleaning and unblocking system from IQ Design will have make life easier for plumbers and those engaging in DIY jobs. 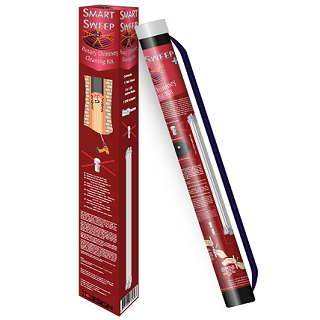 The Smart Rod rotary draining cleaning kit is a novel method of dealing with blockages and obstructions in drains. 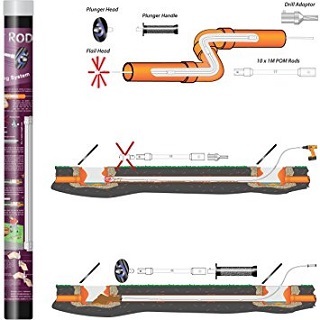 Smart Rod utilizes a rotating head fitted with Nylon flails to break up any encrusted deposits. The flail head is advanced along the drain pipe with sections of flexible POM rod. It is rotated while being advanced with the use of a battery operated drill gun. The flexible POM rods that are used to advance the heads allow the system to operate around tight right angle bends and even "S" bends which would not be possible for conventional drain clearing rods. What comes in the Rotary Drain Cleaning Kit? 10 x 1.00 metre POM rods: There are ten rods supplied with this kit – providing sufficient assembly to remove any stubborn blockages untill the first access point ie reached. 1 x Drill Adaptor The Drill Adaptor: should be used in a conventional drill chuck. Drills should be set without hammer action. 1 x Flail Head with 8 Flails: The Flail Head is designed to break up any encrusted deposits. 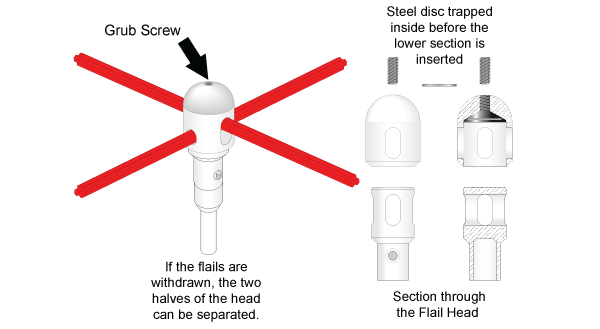 1 x Plunger Head: designed to push any remaining residue along the drain into the next suitable access point for removal. 1 x Side Cutter Head: which when rotated will loosen fabric materials or heavy paper blockages. 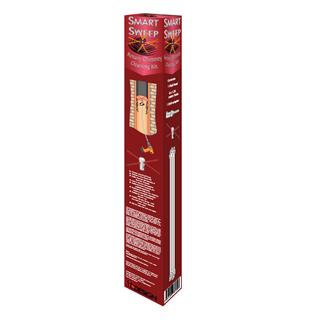 1 x Bulb Auger Head: which when rotated will impale fabric material or heavy paper blockages. 1 x Grease Cutter Head: which when rotated is designed to loosen, push through and remove grease deposits. 1 x "C" Cutter Head: which when rotated is designed to loosen and remove more stubborn deposits. 1 x Plunger Handle: Designed to be used when pushing the remaining residue with the Plunge Head. Once connected to a POM rod, The Flail Head is inserted into the drain pipe and the other end of the rod is "snapped" onto the Drill Adaptor. As the Flail advances, more rods are applied in the same way. The flails have a diameter of 300mm (12") and are designed to distort as the head is pushed into the drain pipe. Because the Drain Rod joints are not secured by a screw thread, the drill can be set to run in either the forward or reverse direction without the possibility of the rods separating. This can be an advantage where stubborn blockages are encountered. As the Flail Head is rotated and pushed along the sewer pipe to loosen deposits or blockages, more rods as required are added until the blockage has been removed or significantly broken up. Once the Flail Head appears at an access point and it can be seen that the Flail Head has loosened or removed the blockage, the rods are withdrawn. The Plunger Head is fitted and any remaining residue in the drain can now be pushed along the drain into the next suitable access point for removal. The Plunger Head and connected Rods are pushed into the drain pipe adding Rods as required. Use the Push Handle for the purpose. The Side Cutter Head which features a 47mm wide toothed "claw" which when rotated will loosen fabric materials or heavy paper blockages which can then be withdrawn or pushed on to the drain cleaning point. The Bulb Auger Head which features a 27mm diameter pointed spiral head which when rotated will impale fabric material or heavy paper blockages which can then be withdrawn or pushed on to the drain cleaning point. The Grease Cutter which features a heavy 33mm wide blade which when rotated is designed to loosen, push through and remove stubborn grease deposits. The "C"Cutter Head which features a heavy 33mm wide blade which when rotated is designed to loosen and remove more stubborn deposits, after which the Flail or Plunger Head should be more effective. If Flails need to be replaced, the grub screw in the top of the dome is loosened. The existing flails can be withdrawn. Two new sets of 300mm long flails are inserted from each direction and cross over in the middle of the head so that about 130mm projects from each quarter of the head surface. Once the flails are correctly located and with the steel disc correctly located, the grub screw is fully tightened. As the grub screw is secured it applies pressure onto the steel disc and ensures that the two lower sections of the flail head are forced apart by the captured flails and locks them in position. 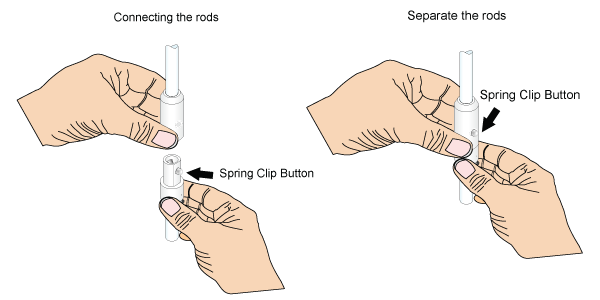 To connect two rods, align the flat sections and the button of the two halves, depress the Spring Clip Button and push the sections together until the button snaps out indicating a secure joint. To separate the connectors, firmly depress the button and the two halves can be parted. The Flail Head and the Plunger Head are both designed to be "snapped" onto the Male end of a Rod and the Drill Adaptor snaps into the female end of a rod.